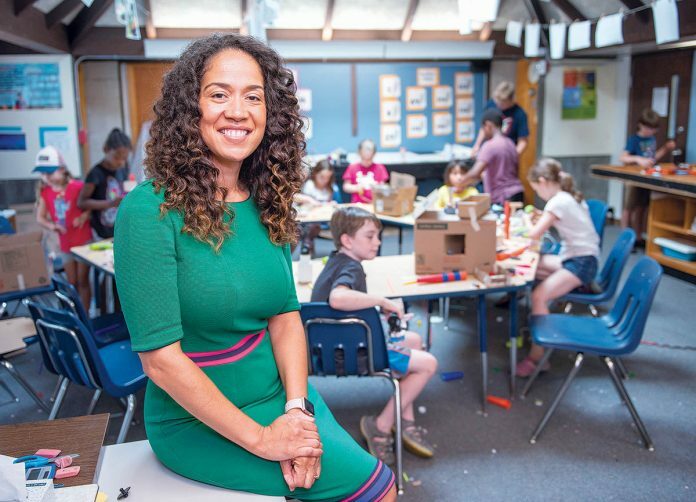 INCLUSIVE APPROACH: Noni Thomas López, head of school at the Gordon School in East Providence, says the school is founded on the idea of inclusivity, which is why it has launched a new individualized tuition payment program for families this year in order to diversify its student population. Gordon School and other independent schools that have re-examined their tuition policies in recent years have reached a similar conclusion. If they want to diversify the enrollment, they can’t expect a family that earns $80,000 and has limited assets to pay the same tuition as one with $200,000 in annual income and a home worth more than $1 million. Gordon School, which educates students in nursery through eighth grade, responded this year by launching a new payment program, Family Individualized Tuition. The program involves what the name implies. Each family that sends a child, or children, to the school pays a tuition that is uniquely theirs, based on a formula that takes into account their income and liquid assets, and a weighting that includes net worth. The tuition is then set, with modest yearly increases, for the next three years to allow families to plan, according to school officials. The idea is to provide parents with a fair tuition amount based on their situation and predictability. For the new school year, the per-child amounts paid by families will vary from $3,500 to $34,500. The unique tuition is a departure from most independent schools, which typically follow a process similar to university or college financial aid in which a standard tuition is applied, often based on the grade level of the child, and then parents can request tuition relief. Across the country, independent schools that are embracing more-flexible tuition, or individual amounts, have said the language around traditional financial aid makes some parents uneasy about applying for it. And many parents, unfamiliar with the private-school traditions, may be unaware that financial aid is available, said Myra McGovern, a spokeswoman for the National Association of Independent Schools in Washington, D.C.
Schools moving to alternate models include Vistamar School, a private high school in El Segundo, Calif., which has a moderated tuition program also intended to help diversify the school, and Duke School in Durham, N.C., a preschool to eighth-grade school that has an indexed tuition program based on family need. In Rhode Island, The Providence Country Day School, a private school for the middle and high school grades in East Providence, operates a sliding-scale tuition program. Its website states the program is intended to allow families with demonstrated financial need to send children to the school. “We know that the published cost of tuition can make it seemingly impossible for many families to consider independent schools as an option, and we have worked hard to change that perception,” the site explained. At Gordon, the school considered how to design the new tuition approach for several years. Existing families were transitioned to the new program. What is driving it is the changing demographics of families sending their children to the school, and the desire for more diversity. One of the changes among families, over time, is that increasingly more parents are sending their children to the school based on earned income, rather than inherited wealth, said Tom Cicatiello, chief financial officer. The new model puts a weighting for net worth, which is more heavily a factor as it approaches $700,000. The per-child rate is based on adjusted gross income for a family and can be as high as 12 percent or as low as 8 percent of that income, based on how many children attend, he explained. Why would one family agree to pay tens of thousands per year while another paid only a few thousand? Most families want to see the benefit of diversification for their children, according to school officials. And when the tuition is billed, unlike the old system, families are not getting a document that indicates what “discount” they’re not paying. That change is more than psychological, explained Thomas López. “You don’t want this idea in a small community that there are affluent parents funding the participation and attendance of children of lesser means. We are a community. We all contribute, and it’s done in an equitable way,” she explained.